Diesel RC » Blog Archive » FS-52 Spark Runs Great! 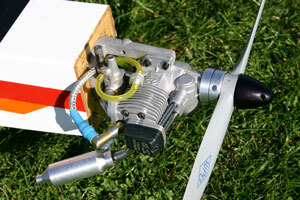 I’ve flown the FS-52 with spark ignition with methanol fuel. The fuel was 8% Klotz Original Techniplate and balance methanol. After test running the engine with this fuel at home, I checked for oil under the rocker cover. There was plenty. I’m convinced the crankcase ventilation system works as it should and draws oil through the engine well. Flights went well and the engine starts easily. I’m very happy with the outcome. Before it get too cold in Chicagoland I plan to test run E85 and possibly gasoline fuel. I’m concerned that oil for gasoline wil not blend with the alcohol compatible oil already in the engine. This may require a flush of the crankcase. Click the image for a link to the project page. This entry was posted on Wednesday, October 15th, 2008 at 3:44 pm	and is filed under Engine Topics, News. You can follow any responses to this entry through the RSS 2.0 feed. You can leave a response, or trackback from your own site.